The University of Plymouth is looking to expand its links with global defence and security company Thales after it opened a new facility in the city. The Maritime Autonomy Centre, at Turnchapel Wharf, aims to build on Thales’s leadership in autonomous systems and strengthen the position of UK industry in this emerging market. It is envisaged it will change the way autonomous capability is developed over the next decade by enabling rapid exploration and exploitation of emergent and disruptive technologies. Thales will be working closely with the Royal Navy, and is also in talks with the University’s Faculty of Science and Engineering over potential collaborations. The new centre complements existing facilities on the University campus, and technologies being developed there could first be tested in the COAST Laboratory. It could also generate opportunities for academics from the Autonomous Marine Systems Research Group, the Maritime Cyber Threats Research Group and those in Navigation and Maritime Science, as well as students on existing courses and a forthcoming MSc in Autonomous Systems. 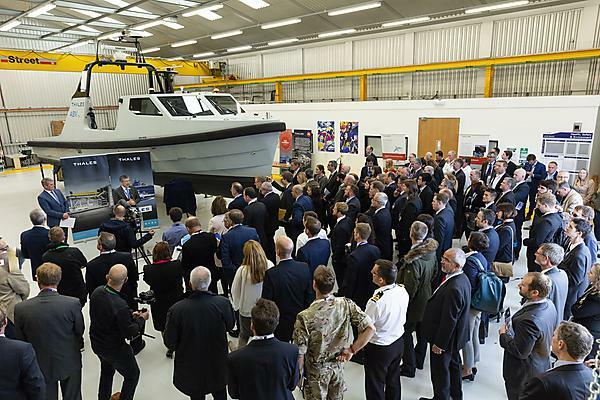 Thales has invested £1 million in the waterfront facility, which will specifically provide access to trials areas for the development of maritime autonomous systems. The centre is also an integral part of a joint programme between the UK and French government to develop the next generation of autonomous mine hunting systems (maritime mine counter measures, or MMCM).